You know when your nasal passages and sinuses aren’t moist, they aren’t happy, and neither are you. Usually, when you have dry mucous membranes, inflammation is present, and that only adds more to our distress. Inflammation of the nasal passages that lasts for at least 12 weeks is also known as chronic sinusitis. Chronic sinusitis can prevent mucus drainage and can cause mucus buildup, which can make breathing through your nose difficult. Also, your face also might experience facial tenderness and pain and may feel swollen. Luckily, there are simple chronic sinusitis tips you can follow so you can feel better, fast. Unfortunately, chronic sinusitis is a pretty common condition, but all hope is not lost. If chronic sinusitis has got you down, fight back with some of these simple lifestyle remedies and chronic sinusitis tips! To help dilute mucus and promote drainage, make sure you drink plenty of fluids. Drinking juice or water is best. Just make sure you avoid beverages that contain alcohol or caffeine. Both can dehydrate you and alcohol can increase the swelling of the lining of the nose and sinuses. Sleep is one of the best things you can get when you are not feeling well. Your body can not heal if it is exhausted and worn down, so make sure you get plenty of rest every night. Aim to have a good 8 hours of sleep. Sleep can help your body fight inflammation and speed up your recovery time. You may remember this old remedy, but it is tried and true. If you are suffering from facial pain and inflammation and are looking for relief, apply warm compresses to your face. To help ease the pain, place these warm towels around your eyes, nose, and cheeks. Keeping your sinus cavities moisturized will help give you relief, help ease your pain and can help your mucus drain. You can do this by either taking a hot shower or by placing your head over a bowl of medium-hot water with a towel draped over your head so you can breathe in the vapor from the hot water. To help clear out your sinuses, use a specially designed instrument to rinse out your nasal passages. You want to make sure this device is intended for your nose, such as a neti pot or sinus rinse squeeze bottle. Remember, if you make your own rinse only use water that is contaminant free, such as sterile or distilled water. • If you suffer from severe, chronic allergies work with your doctor to help keep your symptoms under control. • If the air in your home is dry, add some moisture to the air by using a humidifier at home. Just make sure you keep the humidifier clean and free of mold! 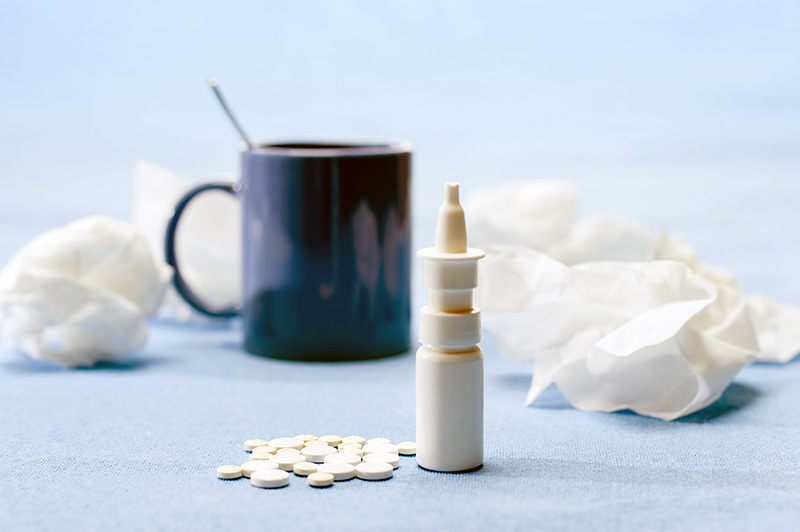 • If someone you know has a cold, try your best to minimize contact with them. • Get plenty of rest, eat nutritious foods, and keep your body hydrated by drinking plenty of water daily. • Practice good hygienic practices. Make sure you wash your hands with soap and water, especially before meals. • Contaminants in the air and tobacco smoke can irritate your lungs and nasal passages, so try your best to avoid cigarette smoke and polluted air. If it can’t be avoided, make sure to use an air filter in your home to remove the contaminants and smoke from the air. Blame Your Body for Sinusitis?